This artist's impression shows the Dream Chaser Cargo System concept in orbit above Earth. After losing a bid to SpaceX and Boeing to taxi astronauts to the International Space Station, Sierra Nevada's miniature space shuttle Dream Chaser will have a new mission — flying cargo for NASA. "It's pretty emotional. We've been chasing this for a long time," corporate vice president Mark Sirangelo, head of Sierra Nevada's Space Systems, told Discovery News. The space agency also re-hired SpaceX and Orbital ATK, which currently fly cargo to the station. Each company's contract covers at least six cargo runs to the station between 2019 and 2024. The Dream Chaser Cargo System builds on the mini-space shuttle design Sierra Nevada has been working on for a decade, including four years with NASA backing. The robotic version of Dream Chaser features foldable wings so the spaceship can fit inside standard 5-meter payload fairings, used by United Launch Alliance's Atlas 5 rocket, the baseline vehicle for the cargo resupply missions, as well as Arianespace's Ariane booster. The Dream Chaser freighter also includes a detachable piggyback cargo module that will be discarded during atmospheric re-entry. Equipment and experiments samples inside the spaceship can be quickly retrived once the vehicle makes its airplane-like landing on a runway. "We're home within eight- to 10 hours and we're off-loading within 30 minutes of landing," Sirangelo told Discovery News in an interview last year. Dream Chaser can carry up to about 44,000 pounds of cargo inside the vehicle and another 4,400 pounds of unpressurized cargo in four flights per year, exceeding NASA's delivery requirement by about 11,000 pounds per year. The cargo version of Dream Chaser also can discard trash and return cargo, giving NASA more options. SpaceX's Dragon capsules make parachute splashdowns in the Pacific Ocean, while Orbital's Cygnus capsules burn up during atmospheric re-entry. Dream Chaser is the only vehicle that lands on a runway. "We believe that it's the best cargo system that currently exists or will exist, because it’s capable of meeting all of NASA's cargo requirements in the same system," Sirangelo told reporters at an industry trade show last year. 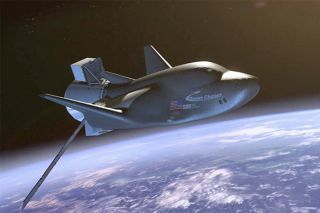 Sierra Nevada had proposed a crewed version of Dream Chaser under NASA's Commercial Crew program. The space agency opted for a passenger version of SpaceX's Dragon capsule and a new offering from Boeing called the CST-100 Starliner. The vehicles are expected to begin transporting crew in 2017.